Drawing shapes is one of those crucial things we do in OpenGL, because if we don’t draw anything, we don’t see anything. This tutorial was originally very simple, we drew a simple square, but I am going to extend it further and actually show how a bunch of different primitive types work, but don’t worry, we will still get to draw our square. Let me give you a brief rundown of these shapes. As the name implies, this draws a line from one point to another in 3D space. A line strip is a series of lines, where each point in the line has a point before it and after it, except for the end points. This is useful if you want to draw a series of lines, maybe you want to draw a circle and a circle is a set of lines. This is similar to the GL_LINE_STRIP, except the end points double back to each other. So the first point will automatically connect to the end point via one line. Draws a series of points in 3D space, their size can also be changed. A polygon is a 3D shape with any number of vertices, it is a filled surface. A quad is similar to a polygon, but it limits the number of vertices to 4. This allows OpenGL to break it up into two triangles quite simply for faster processing. In short, a quad is a shape with 4 sides. A quad strip is a line of quads, where each quad shares two vertices with the quad before, and after it. Triangles are the ultimate shape in 3D geometry, this is because you can quickly and efficiently calculate how to fill them. GL_TRIANGLES takes a series of 3 vertices; each 3 vertices describe the points for a triangle. A triangle fan has one central vertex, and all other vertices form triangles extending from this point. Very useful for drawing filled circles. A triangle strip is similar to a quad strip and a line strip, but it uses triangles, where two of the three vertices are shared with a triangle before and after itself. So let’s stop babbling and get on to drawing a square. I am going to implement a new method, in order to keep our code nice and tidy. This method will be called renderPrimitive and will take no parameters. Now inside of our display method, we are going to want to call this, so before our glFlush line, make a call to render Primitive. Ok, good, we have a method we can fill to draw our shape, and we are calling it in our render loop. Next up, we aren’t going to go straight to drawing our shape, but we are going to add a line above our renderPrimitive call, and I’ll explain why. The default position for the camera in OpenGL is at the world origin, which is (0, 0, 0) in 3D space. Because we have a near plane at 1.0, anything drawn between the values of 0.0 and 1.0 on the z axis will be culled automatically. In other words, it won’t be drawn. In order to make sure we can see our shape, instead of positioning further along the z-axis when I set the vertices, I am going to move the entire scene back 5 units, so anything we draw at (0, 0, 0) will actually be drawn at (0, 0, 5). This may sound a little complicated, but trust me on this, and it will be explained a little more in the camera tutorial as the camera tutorial consists of 4 calls we do, before any of our rendering, to make sure we can see what we want. Now, you can go ahead and add a line before our call to renderPrimitive which will translate (move) our scene 5 units in front of us. This is done with a call to glTranslate which takes three parameters, each one relating to how much we want to move everything on the x, y and z axis. And finally everything is now set up for us to actually draw our square. When we want to tell OpenGL we are drawing some geometry, we need to make two calls, one at the start to tell OpenGL we now want to draw a shape, and one at the end, telling OpenGL we have finished drawing our shape. These calls are glBegin and glEnd, relating to the beginning and the ending of our shape drawing, and glBegin takes one of the geometry types I mentioned earlier as a parameter. 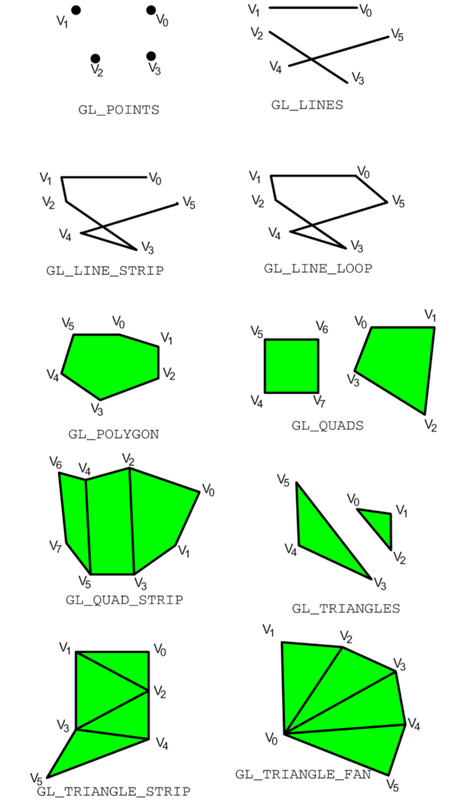 Because we are drawing a square, I am going to settle for GL_QUADS, although it would be more efficient to go for a GL_TRIANGLE_STRIP and supply 5 vertices to OpenGL to get the performance of triangles, I am going for simplicity and using only 4 vertices for a quad. At the moment, OpenGL will happily accept this code, but we won’t see anything on the screen. This is because we need to supply the vertex data for each corner of the quad to OpenGL. To make a call to create a vertex we use glVertex. glVertex can take either two or three parameters, and the types for the parameters can change, depending on the type of glVertex call. For example, if we want to draw a 2D vertex using float values, we would call glVertex2f. If we want to create a 3D vertex using double values, we would call glVertex3d. The same also works for integer values, and even arrays of data. To be clear, the centre of the window, because I have only moved the camera back, is at the location (0, 0, 0). To draw our quad, we are going to create 4 vertices that revolve around this point. I am first going to declare the bottom left corner, followed by the top left, top right and bottom right. This is because it makes it simple to follow how texture coordinates will be assigned later on, as they go in this order. You should now be able to compile and run this, and have it draw a white square in the middle of your window. Go ahead and experiment with the other geometry types. You should be able to create the square, both filled and outlined, using any of the geometry types above. 24 Responses to "4. OpenGL Primitives – Square (Version 2.0)"
Thanks a lot for the wonderful tutorials, the easiest and the most descriptive of tutorials available on the Net. I’m glad, i found your website. Thanks alot … I have a problem here, why is that my keyfunction doesn’t working? gluPerspective() has been removed from GLU. Other than that, thanks for a great intro article. For the different drawing types here is a quick image that can explain any person without reading tons of text :)…. Thanks, I am getting started with OpenGL. I have bookmarked this site for reference. Btw – The colors and they way you layed it out makes it easy to read. Thank you very much for putting up this site and the time you put into it. Hello, these tutorials have been a big help! I didn’t feel like going through nehe’s window framework so I just read the lessons and apply them to projects. Some of his projects are converted to glut to which helps. Anyways, having some tutorials using glut makes it much easier to learn actual OpenGL code. I can always learn how to make my own window framework later. I’ll hopefully get some working OpenGL games by the end of the week, I’ll post my progress if I have time. Thanks! I’m glad it could help. This site started off back in the day as a means to show how to achieve certain effects, and has since grown into full fledged tutorials to show how to use the actual OpenGL code. In these tutorials, GLUT allows that, but in the OpenGL 3.x and 4.x tutorials, there is no GLUT equivalent at the time of writing (If there was, I simply didn’t hear of it). Well I decided to go with learning the older versions because there seems to be more info and I’m sure when I decide to convert to the newer versions, it won’t be as hard. Hey, want to say that I’ve been reading a book on OpenGL programming but your tutorials are much better. I’ve also got a question: I wanted to test changing one of the coordinates of a vertex of the quad, so I declared the global variable ‘corner’. I set it to change when the key ‘a’ was pressed (add 0.01f to ‘corner’). I’m getting unexpected behavior; the quad only changes if I click on the window (???). I tried eliminating the key presses and put the line “corner += 0.01f;” in the renderPrimitive function but the quad only changes when I rapidly click on the window. Any idea what the issue might be? Thanks. At the end of your keypress function, you could include a call to tell OpenGL to update, possibly add glutPostRedisplay(). If that doesn’t work, is your window constantly losing focus? I can’t see any quad there. O.o I did everything just as you did but I just can’t see any quads. It sounds like something is missing. The code I have provided, *will* show a quad, no matter what system you are on, as long as it supports OpenGL. It seems like it had something to do with the positions. I edited the translate values a bit and got the cube visible. It seems for some reason using this code that the line: if (keyStates[GLUT_KEY_LEFT]) always returns true. It does also not change when I press the left key. It also does not seem to work with the ‘a’ key, and neither if I just enter the ascii code number. Got it working now – seems the booleans where set to have true as default. Glut_KEY_LEFT is not working yet though. Only if I specify the ascii code from it, which is fine for me. I thought I had fixed this tutorial up, but apparently not. GLUT_KEY_LEFT and other special keys don’t actually work with glutKeyboardFunc, they only work with glutSpecialFunc. i am not able to compile the above code. its giving an error with the 4th line of your code…i am using VS2010 and GLUT.can you tell me what is going wrong ? What is the error you are getting? I have all of the version 2.0 tutorials successfully running in VS2010. As long as you have created a standard c++ win32 console application, everything should be fine. You will want to look at the third camera tutorial for rotating around an object. But I don’t have any tutorials on model loading. in the example you have declared viewport equal to window size.. e.g. my window size – 100, 100. so viewport will be equal to 0-100 width and 0-100 height. why the coordinates range is ~-2.5 to 2.5. This has to do with the maths behind projection matrices. It’s a little complicated to say off the top of my head, so if you fully want to understand it, have a quick search around on Google, there is a lot information around. Also, I’ll point out that OpenGL does not use it’s measurement in pixels, it uses units which can be any length depending on the implementation. You will also notice, that the further back into the scene an object is, the more you can move it to the left/right and top/bottom and still see it because of the perspective view. First of all: Really great tutorials! My question: Why is there a “f” behind every number? I thought it is set to float by the first “f”. The glTranslatef with an f on the end is just the OpenGL method that takes float values. Putting an f on the end, is a c++ way of saying this is a float and not a double. Some languages need you to declare the f on the end to distinguish between a float and a double.